Blackhawk DE-CB Collapsible Breacher FREE SHIPPING! The Collapsible Breacher from Blackhawk! is a tough, versatile breaching tool optimized for tactical and rescue applications. Its solid, military-grade, steel-wedged head offers unstoppable prying strength. 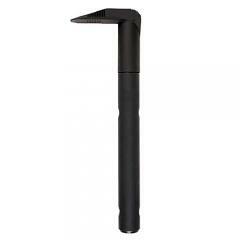 The tool can be used to lift doors off their hinges, pry open windows, tear open car doors and more. Counter-angle friction grooves line the Breacher's end to prevent slippage and provide additional gripping strength. The collapsible handle features an epoxied fiberglass core encased in dual-locking steel tubes in order to offer the unrelenting strength demanded by field operatives. When collapsed, the handle delivers the mobility needed to work efficiently in tight quarters or it can be expanded to provide extra power when working on particularly stubborn entryways. A weather-resistant rubber handgrip ensures a secure grip while in cold, wet or otherwise inclement field conditions. ©2002-2019 CopsPlus.com: Blackhawk DE-CB Collapsible Breacher FREE SHIPPING!